Stirred by the visionary power of "Dark City," I revisited Fritz Lang's "Metropolis" and once again fell under its eerie spell. The movie has a plot that defies common sense, but its very discontinuity is a strength. It makes "Metropolis" hallucinatory--a nightmare without the reassurance of a steadying story line. Few films have ever been more visually exhilarating. What many of these movies have in common is a loner hero who discovers the inner workings of the future society, penetrating the system that would control the population. Even Batman's villains are the descendants of Rotwang, giggling as they pull the levels that will enforce their will. The buried message is powerful: Science and industry will become the weapons of demagogues. “Metropolis” employed vast sets, 25,000 extras and astonishing special effects to create two worlds: the great city of Metropolis, with its stadiums, skyscrapers and expressways in the sky, and the subterranean workers’ city, where the clock face shows 10 hours to cram another day into the work week. Lang's film is the summit of German Expressionism, the combination of stylized sets, dramatic camera angles, bold shadows and frankly artificial theatrics. The production itself made even Stanley Kubrick's mania for control look benign. According to Patrick McGilligan's book Fritz Lang: The Nature of the Beast, the extras were hurled into violent mob scenes, made to stand for hours in cold water and handled more like props than human beings. The heroine was made to jump from high places, and when she was burned at a stake, Lang used real flames. The irony was that Lang's directorial style was not unlike the approach of the villain in his film. The story tells of a great city whose two halves--the pampered citizens of the surface and the slaves of the depths--are ignorant of one another. The city is run by the ruthless Joh Fredersen (Alfred Abel), a businessman-dictator. His son Freder (Gustav Froehlich) is in the Pleasure Gardens one day when Maria (Brigitte Helm), a woman from the subterranean city, brings a group of workers' children to the surface. Freder, struck by Maria’s beauty and astonished to learn of the life led by the workers, seeks out the demented genius Rotwang (Rudolf Klein-Rogge), who knows the secrets of the lower world. Lang develops this story with scenes of astonishing originality. Consider the first glimpse of the underground power plant, with workers straining to move heavy dial hands back and forth. What they're doing makes no logical sense, but visually the connection is obvious: They are controlled like hands on a clock. And when the machinery explodes, Freder has a vision in which the machinery turns into an obscene devouring monster. Other dramatic visual sequences: a chase scene in the darkened catacombs, with the real Maria pursued by Rotwang (the beam of his light is like a club to bludgeon her). The image of the Tower of Babel as Maria addresses the workers. Their faces, arrayed in darkness from the top to the bottom of the screen. The doors in Rotwang's house, opening and closing on their own. The lascivious dance of the false Maria, as the workers look on, the screen filled with large, wet, staring eyeballs. The flood of the lower city and the undulating arms of the children flocking to Maria to be saved. The gaps and logical puzzles of the story (some caused by clumsy re-editing after the film left Lang's hands) are swept away by this torrent of images. “To enjoy the film, the viewer must observe but never think,” the critic Arthur Lennig said, and Pauline Kael contrasted its “moments of almost incredible beauty and power” with “absurd ineptitudes.” Even when the plot seems adrift, the movie itself never lacks confidence: The city and system are so overpowering they dwarf any merely logical problems. Although Lang saw his movie as anti-authoritarian, the Nazis liked it enough to offer him control of their film industry (he fled to America instead). Some of the ideas in “Metropolis” seem echoed in Leni Riefenstahl's pro-Hitler “Triumph of the Will”(1935)--where, of course, they have lost their irony. Much of what we see in “Metropolis” doesn't exist except in visual trickery. The special effects were the work of Eugene Schuefftan, who later worked in Hollywood as the cinematographer of “Lilith” and “The Hustler.” According to Magill's Survey of Cinema, his photographic system “allowed people and miniature sets to be combined in a single shot, through the use of mirrors, rather than laboratory work.” Other effects were created in the camera by cinematographer Karl Freund. The result was astonishing for its time. Without all of the digital tricks of today, “Metropolis” fills the imagination. Today the effects look like effects, but that's their appeal. Looking at the original “King Kong” not long ago, I found that its effects, primitive by modern standards, gained a certain weird effectiveness. Because they looked strange and unworldly compared to the slick, utterly convincing effects that are now possible, they were more evocative: The effects in movies like “Jurassic Park” and “Titanic” are done so well, by comparison, that we simply think we are looking at real things, which is not quite the same kind of fun. 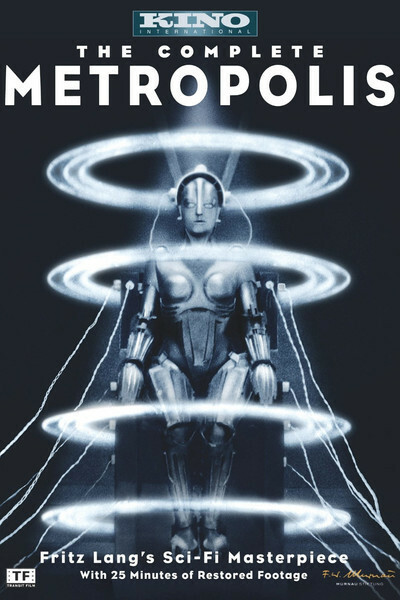 “Metropolis” has not existed for years in the version that Lang completed. It was chopped by distributors, censors and exhibitors, key footage was lost, and only by referring to the novelization of the story by Thea vonHarbou can various story gaps be explained. In 1984 a reconstructed version was released, adding footage gathered from Germany and Australia to existing prints, and that version, produced by Giorgio Moroder, was color tinted “according to Lang's original intentions” and given an MTV-style musical score. This is the version most often seen today. Purists quite reasonably object to it, but one can turn off the sound and dial down the color to create a silent black-and-white print. I am not crazy about the soundtrack, but in watching the Moroder version I enjoyed the tinting and felt that Lang's vision was so powerful it swept aside the quibbles: It's better to see this well-restored print with all the available footage than to stand entirely on principle. “Metropolis” does what many great films do, creating a time, place and characters so striking that they become part of our arsenal of images for imagining the world. The ideas of “Metropolis” have been so often absorbed into popular culture that its horrific future city is almost a given (when Albert Brooks dared to create an alternative utopian future in 1991 with “Defending Your Life,” it seemed wrong, somehow, without Satanic urban hellscapes). Lang filmed for nearly a year, driven by obsession, often cruel to his colleagues, a perfectionist madman, and the result is one of those seminal films without which the others cannot be fully appreciated.